Known for her "purity and flawless range" (South Florida Classical Review), soprano Sarah Moyer was exclusively featured in the 2014 the Boston Globe Magazine for her work as a professional singing artist and deemed her “the kind of church singer who will rock your sacred-music world”. As a soloist, her recent repertoire includes Handel’s Messiah with Variant Six and Bourbon Baroque, Handel’s Ode for St. Cecilia’s Day with Emmanuel Music, Haydn's Salve Regina with Masterworks Chorale, Vivaldi's All'ombra di sospetto and Handel's Nel dolce dell'oblio with Les Bostonades, American premieres of Melani's Regina Coeli a5 and Teodora with Reed College Collegium, world premieres of Kallembach's Easter Oratorio and Theofanidis' Four Levertov Settings (performed a second time at the Aspen Music Festival) with Seraphic Fire, American premieres of Nørgård's Nova Genitura and Seadrift with Lost Dog New Music Ensemble, Foss' The Prairie with Boston Modern Orchestra Project, and Buxtehude’s Membra Jesu Nostri; she also "beautifully executed" (Miami Herald) the world premiere of Runestad's The Hope of Loving with Seraphic Fire in the Fall of 2015, and was described as "perfect for Baroque works... one wants to hear more from this obviously gifted singer" (South Florida Classical Review) for her brief performance in Handel's My Heart is Inditing. A frequent interpreter of Bach, her most recent engagements include O heilges Geist – und Wasserbad, Aus tiefer Not schrei ich zu dir, and Süsser Trost, mein Jesus kömmt with Emmanuel Music, Wedding Cantata with Kaleidoscope Chamber Ensemble, Mass in B Minor, Wachet auf, ruft uns die Stimme, and Gott ist mein König (Ripieni) with Music at Marsh Chapel, Schweigt stille, plaudert nicht, Es ist nichts gesundes an meinem Leibe, and Jauchzet Gott in allen Landen (at the Boston Early Music Festival Fringe Series) with New England Conservatory’s Carr Collegium. Ms. Moyer is simultaneously active as a choral artist. Nationally she appears frequently with Skylark (New England), GRAMMY® nominated Seraphic Fire (Miami, FL), Santa Fe Desert Chorale (Santa Fe, NM), GRAMMY® nominated True Concord (Tucson, AZ), Lorelei Ensemble (Boston, MA), The Thirteen (D.C.), Ensemble Origo (New England), and Spire (Kansas City, MO). She is a founding member of Illumine, a trio devoted creating arrangements and recordings for soprano, trumpet, and harp. 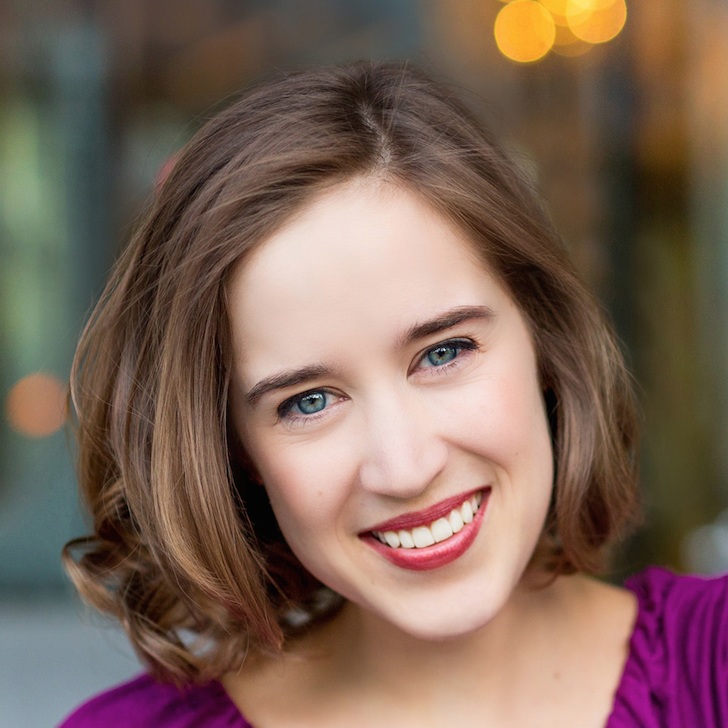 Locally, Moyer sings regularly with Boston’s various religious institutions such as Emmanuel Music, Church of the Advent (Beacon Hill), Trinity Church (Copley Square), and Boston University’s Marsh Chapel where she is a former Choral Scholar, among others. She has also supported music education by presenting masterclasses and workshops with Skylark, and through performing with the Handel and Haydn Society Outreach Vocal Quartet from 2014-2016. She is a recipient of the 2015 St. Botolph Emerging Artist Award. ​Moyer received her Bachelor's degree in Vocal Performance from Oklahoma State University (2009) where she studied with Anne-Marie Condacse and gained the bulk of her choral training under conductors Dirk Garner, Mark Lawlor, and Natasa Kaurin-Karaca. She completed a Master's degree in Vocal Performance at New England Conservatory (2011) in the studio of Carole Haber, with whom she still studies.